Benedict Heinzl had the most liked content! So here is what I've gathered from facebook It's the second "modular" sled from Tiffen. Most parts are interchangeable with the M-1. It is the successor to Archer2 & Shadow. It has Volt electronics built into the topstage. I'd love to post pictures here but they are not mine and as far as I know there is no official marketing material yet. Had simmilar problems once. Got this from Danny at Tiffen: Top stage at the post might be loose. To access the top of the stage, you’ll need to remove the tilt head, by removing the two shafts behind the kip handle locks. Taking off is relatively easy. Putting back takes some skill and is a little fiddly. Once removed, check that are the 5 screws that connect the stage to the base: The collar this crown is integral with, is pinned in 4 places around the top of the post, and bonded in place. Make sure this hasn’t moved. If it has it could be more serious, and will need work to reattach. Good Luck, Best B.
monitor audio during capture in Media Express? I know Frederik Lillie Rudolph from my workshop in Denmark. 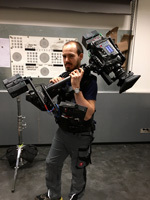 He works at http://redrental.dk/rental-equipment/stabilization/ They have a couple of rigs. BUMP - 2400€ Serious offers please. Based in Vienna, Austria. BUMP - 2450€ Has a new back-part. And has been sitting around in my flat for too long. Hi Lisa! The safety pins were already planned :) Here is the Version with all the suggestions incorporated. 6x 1/4-20 mounting points 2x slots for accessory mounting 2x M4 mounting points for a future rod clamp Safety pins! If there is anything else please let me know. If there are enough people who want one I'll try and get a better deal for manufacturing. I'll keep you updated! Mine too ;) (at least of the ones I own, Exo is tempting as ever) But my modified U2 suits me better ;) So this one has to go.